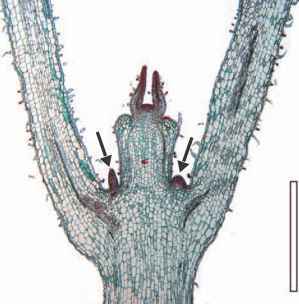 figure 7.2 Longitudinal section of Coleus stem showing apex and axillary buds (arrows) (Extant). Bar = 600 pm. growth, that is, vertical growth, in the plant. Laterals (leaves and branches) are borne at nodes on the stem separated by internodes (FIG. 7.2). Roots have no nodes or internodes. Although all extant plants bear laterals of some sort, some of the earliest land plants (Chapter 8) were leafless, photosyn-thetic axes. Branches are produced either at the apex, by division of the apex, or in seed plants, they can also be produced from axillary buds. See Chapter 8 for the different types of apical branching that occur in early vascular plants. Axillary buds develop at nodes in the angle (the axil) where the leaf meets the stem (FIG. 7.2). Most vascular cryptogams (vascular plants that do not reproduce with seeds) do not have axillary branching, although there are exceptions to this rule in the fossil record. Many plants also produce adventitious organs, the most common being adventitious roots. Adventitious organs are those that develop somewhere on the plant where they do not normally arise. Since a primary root usually arises from the base of the primary embryonic axis, roots are commonly termed adventitious if they arise anywhere else on the plant, for example, from the nodes of the stem and leaf (Barlow, 1994). The basic organs of plants thus consist of stems, roots, and leaves, although the stem and leaf may be treated together as the shoot. Reproductive structures, such as cones and flowers, represent combinations and modifications of these basic organ types, for example, cones or strobili consist of a central axis (stem) with helical or whorled laterals. The laterals are most commonly sporophylls—modified leaves that bear sporangia. Floral parts in the angiosperms are also believed to represent evolutionarily modified leaves (see Chapter 22), and the flower itself consists of a shoot bearing floral parts. 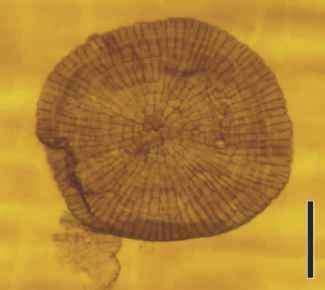 In some cases, the fossil record provides evidence of the evolution of these various modifications of plant organs, but in other cases, the evidence is less clear. Most plant anatomy texts concentrate on the anatomy of the flowering plants. Details that differ from angiosperms in various groups will be covered in those particular chapters, for example, ferns (Chapter 11), and seed plants (Chapters 14-22). In addition, details on seed anatomy and evolution are included in Chapter 13, so they will not be repeated here.